We need a handful of dedicated readers to regularly write topical and original Atari news stories. If you are interested, please contact us immediately. Please send your Atari news to matthew@myatari.net. Has Atari gone over the EDGE? 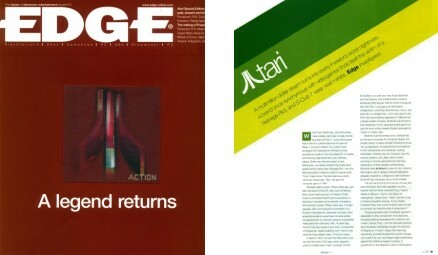 If you interested to learn the past, present and future of Atari - you need to read the February 2002 issue of EDGE magazine. The February issue includes a sixteen page feature on Atari and its new owners, Infogrames. The Atari Special Edition of EDGE magazine is published in the UK by Future Publishing and can be purchased from most UK newsagents for £3.80. For further details, check out the magazine's web site at http://www.edge-online.com. For all you MyMail fans, you'll be pleased to hear that Erik Hall has recently released an updated version of his popular GEM e-mail application. For those of you who are yet to experience MyMail, the latest version can be downloaded from http://www2.tripnet.se/~erikhall/programs/mymail.html. Atari consoles going cheap ... well, cheapish! Last month, MyAtari reported that the retail stores GAME and Electronics Boutique were selling Atari Jaguar and Lynx consoles at ridiculously low prices. By coincidence, our leading story this month is an interview with Ben Grant, the UK Products Manager for EB Stores Group Ltd. In the interview, Ben is quoted as saying "being priced at £9.99 the consoles are definitely an impulse purchase, with some customers purchasing a PS2, a Jaguar and also a Lynx at the same time!". For the latest prices, visit either www.game.uk.com or www.eb.uk.com. With ST users slowly migrating to alternative platforms such as MS Windows (whether we like it or not), Atari emulators have never been more popular. After two years of development, STeem - arguably one of the best Atari STE emulators - has just received a major update (2.1). The latest update sees a number of improvements both in its functionality (new dialog boxes) and compatibility (one or two bugs have been ironed out). If you've ever wanted to run ST software on your PC, you need STeem. To download the latest version, visit http://steem.atari.org. Tim Conrardy (resident MyAtari MIDI buff) recently received a surprise package from Tom Bajoras, ex-programmer for Hybrid Arts. The package contained several floppy disks containing source code for the applications Easy Score Plus, GenEdit, CZ Android, DX Android and Ludwig. If you're interested in continuing development any of these titles, the source code is now available to download at http://groups.yahoo.com/group/atari-midi-archives/files/SOURCE/HybridArt/. Further information on the Hybrid Arts titles is available from Tim's Atari MIDI World at http://tamw.atari-users.net. RGF Software, publishers of Luna, dePAK, GFA Linker and Textal have recently released a beta version of Arthur 2002 (code-named ArthurXP). Arthur is a modern GEM application that employs custom dictionaries to translate words or phrases between languages. The beta version sports an impressive GEM interface and supports all the latest protocols including GEMScript and drag'n'drop. Further details on Arthur and other applications by RGF Software can be found at www.rgfsoft.com.